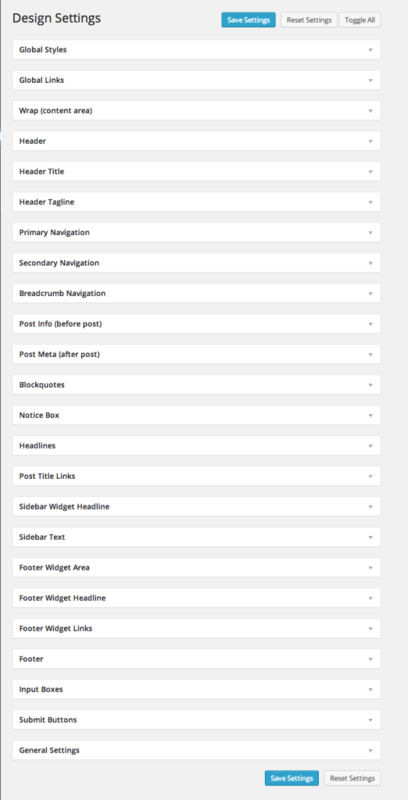 So you’ve finally decided to spring for a professional WordPress theme, and you’ve narrowed the choice down to the Genesis Framework. Let me guess, you can’t figure out which child theme to go with. Based upon my latest count there are over 50 child themes for you to choose from, and that’s just on the StudioPress site. One could drive themselves crazy trying to pick the right theme for their blog. Every one of the Genesis child themes are awesome in their own right, so which one should you go with? When I first decided to go with a StudioPress theme, I spent days upon days looking at each theme, and narrowing the list down to my top 5 or so. How about analysis paralysis. I liked each of the themes I was reviewing, and couldn’t make a choice. Finally stumbled across this video from Amy Lynn Andrews at Blogging with Amy, and it was enough to give me the nudge I needed. My first purchase was the Genesis Prose Theme, part of the Genesis Framework, and thought I’d write a quick review of that theme. Edit: It has come to my attention that StudioPress is no longer selling or updating the Prose Theme. Take a look at this other post on wrote on Genesis Prose theme availability for more information. The selling point for me, in addition to being part of the Genesis Framework, was the ability to customize the design of the theme. This isn’t to say that you can’t customize the other Genesis Theme’s, but you’ll need to jump into the code and CSS in order to do this. With Prose it’s as easy as updating a few fields (ok there’s quite a few options to customize), but you do it all via a design screen. It’s super easy to customize your blog, and you could spend hours and hours tweaking things to get them just right. You can truly make your blog unique with the Genesis Prose Theme. Now keep in mind, you don’t have to do any of this to get your theme up and running. The Prose Theme works just fine “out of the box”, and you can customize it at your leisure. Any initial purchase of a Genesis theme will get you the Genesis Framework. This is required for use with any of the Genesis child theme’s. I’m guessing if you’re reading this post, you already know what that means, so I’ll spare you the details. The StudioPress website has everything you need to know. Free theme’s that claimed they were optimized for SEO really weren’t. You also had to deal with non-standard development which caused its own problems. Worse yet, there could be hidden links that weren’t good for your SEO. I couldn’t be happier with my choice on going with the Genesis Prose Theme. From an ease of use perspective, the look and feel of the theme options isn’t really all that different from other theme’s, so there’s not a huge learning curve. Did I mention the Simple Hooks Plugin? This is a killer way to really customize your theme if your not afraid of a little coding. Hope you found this review of the Genesis Prose Theme helpful. If you decide to go with the Genesis Framework, but select something other then the Prose Theme, you won’t be disappointed. That’s what I did. Once I got my feet wet with the Genesis Prose Theme, I decided to upgrade to a Genesis theme that had a little more pazazz. By the way, to learn more about Blogging Flail, simply click here. [ Smiles ] Craig, I would have chosen the theme that loads the fastest and most importantly, it must be a responsive theme. Couldn’t agree with you more on both of these points Renard. That’s the nice thing about the Genesis Theme’s, they are fast loading and are fully responsive. Thanks for the comment! Great review of Prose theme. I happened to be considering changing up my theme just to give it a different flavor. I definitely appreciate this review and will add this to my list of child themes to use! Thanks Sherman. I use Prose on my personal blog and I really like it. It’s not super fancy but it gets the job done. Super easy to tweak things when needed as well. Glad you found this helpful. BTW – appreciate the sharing earlier! I’m still in the decision/shopping phase for themes. I spoke with a friend last night who uses Genesis and she still thinks I need to go that direction. She’s going to put me on a screen sharing hangout and go over how to use it since I’ve been in hers and it was just confusing to me. I’m thinking it was one of those themes that you couldn’t do a lot with which might be why. Thanks though for introducing the one you’re using and I’ll be sure to take a look at it as well. Hope you’re enjoying your week, thanks for the info. It will be helpful with my ongoing search. You know Adrienne, I’ve tried a number of free theme’s over the years, never really understood why one needed a “premium theme”. So while I’ve been playing around with WordPress over the years, I wouldn’t consider myself an expert at it. When I finally made the decision to go with the Genesis Framework, it really wasn’t that big of a change for me. I guess my point is, don’t let Genesis freak you out. I really don’t find it to be a whole lot different than any of the other theme’s out there. Thanks for the comment Adrienne, always great to see you over here. BTW – I’m not using the Prose Theme on this site, I’ve got it running on my personal blog. If you want to take a look and see what the design looks like, just let me know. Have yourself a great weekend Adrienne! This is my first time visiting your blog. I’ve been a reader of Adrienne’s blog for a long time, and that’s how I found your blog. Adrienne is awesome isn’t she! I know, that’s the problem with the Genesis Framework. There are so many great theme’s to choose from, you could constantly update your design if you get bored with it and still take advantage of all the benefits of the framework. Appreciate the comment and appreciate you stopping by to have a look. Have yourself a wonderful weekend! You did a great job on the review of Genesis Prose. I’ve recently switched themes, and it’s a custom Genesis theme, and already love the speed! I had been using a Woo theme (Fresh News), and before that for the first several years of my business, Thesis, which I really like as well. Anything new, especially learning how to navigate a new theme, is a layering process and takes time to get comfortable with it. I will not be so ‘dug in’ the next time a change is in order, however, and will be willing to be open to something new. Very satisfied with my theme at the moment and will definitely check out Genesis Prose when I’m ready for the next change because I really like the Genesis framework! Thanks for sharing. 🙂 Hope you have a wonderful weekend. I really love the Genesis Framework. Never had a problem with it, the documentation is awesome, and they have so many different theme’s to choose from. 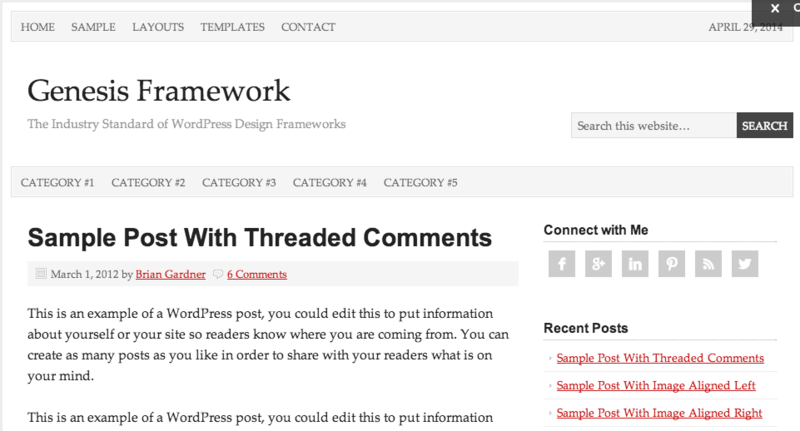 If I get bored with my current theme, I’m simply choose another, and get the same fantastic benefits of the framework. Thanks for the comment Carol. Have yourself a wonderful weekend. Hi, Craig, this is a great review. Tells me everything I’d want to know. You haven’t gone into the details of why Genesis is better than the rest of the pack, I suppose that’s something that everyone knows. I can’t even think of another brand? A good theme makes sense for every website, there are so many benefits beyond how it looks. I’m fairly happy with my current theme – it was free but I checked out what it could do before I installed it. I’ve got tech experience so one thing I look for is whether a theme has clean code that I can tweak – but I can understand the appeal of the settings panel you’ve described. The problem for me is that I’ve tweaked my current theme so much that I’m reluctant to move to a new theme because I won’t find anything quite like it. I’d have a huge job customising it from the start. But I’ll have to update sometime and when I do it’ll be Genesis, I’ve heard so many good things about it! Thanks for the comment Donald! You’re right, I didn’t get into the details of the framework itself, wasn’t really the purpose of the post, but you’re probably right, I could have elaborated on things. I used free theme’s all the time when I was just starting out. There were quite a few that I liked, but there was always something about them that I had issues with. Never really found one that I just fell in love with. After reading a number of reviews on the Genesis Framework, and seeing all of the theme’s they had available, I just had to give it a shot. Haven’t looked back since. Have a great week Donald, and thanks again for the comment. First off, I love the genesis framework. But lately, I’ve been thinking of a change. Either to my theme or making the switch from Genesis to something else. Not sure yet. But I do know I want to have a theme that not everybody already has. But I may just stay with Genesis, but will consider giving Prose a look when I’m making my decision to change and ultimately customize my theme. Thanks for the comment Andrew! I really dig the Genesis Framework, been very happy with it and given all of the child theme’s they have available I can’t imagine myself ever needing something else. Than again, as time goes on you never really know what you may need down the road. Appreciate you stopping by sir! Well, I have not been using Genesis for this moment, but I’ll use it someday. By the way, thanks for sharing this useful post with us, Craig. Hope you can enjoy your day! Thanks Nanda, appreciate the comment. If by chance you do switch over at some point, I’m sure you will not be disappointed. So many folks are using it that if you ever run into problems you can easily find someone to help. I’m a lover of Genesis. I used to be a Thesis user and I switched to Genesis and love it since then. I also got the Pro Plus package (the all theme package) so I can use the themes for my own sites and as well as for my clients’ sites. I love Genesis framework for its simple yet robust structure. And it has made my life so easy since then! Prose is such an elegant and simple theme. It is wonderful for personal blogs 🙂 Thanks for writing your views about the theme! I with ya’ Jane on being a lover of Genesis. As I said in the post, I’ve used a number of free theme’s in the past, but Genesis was my first premium theme. I really don’t think I’d ever need or want to look at anything else. That’s what I loved about Prose, and I still use it on my personal blog. I switched to the Genesis Framework last year, and I’ve never looked back! I went searching and found FOCUS from Genesis, and I chose that theme. So happy I did, too! I’ll have to check out the prose theme. You never know when I decide to migrate to something new! Thanks for the help in the decision-making process! Thanks for the comment Bonnie. I haven’t looked back from Genesis when I made the switch to that, not sure I’d ever try something different, at least for now. Prose it pretty basic, not a lot of bells and whistles, but it’s perfect for my personal blog. You have a great week as well Bonnie! Craig, Thanks for the article on Genesis Prose theme. I am looking at moving my site over to Genesis for the great support they provide and the huge number of options. I was looking at “Prose” because of the ability to customize every element in the theme itself. However, how does this customizer inside Prose compare to what I would get if I went with a different theme and purchased the Genesis “Design Pallet Pro”. Does that do the same things (and more?) then the Prose customizer? Hey Michael – thanks for the comment. First off, the Genesis theme’s are awesome, and you can do a ton with them. Unless you are looking to create a new or heavily tweak a theme, I don’t think you need to purchase Design Pallet Pro. I use Prose on my personal site, and I find it’s perfect for that. I can add a header image, change background colors, font size and color, hyperlink color, and so on. The theme I use on this site is the Magazine Pro theme. I can easily customize the way the front page looks in a variety of different ways, change the overall theme color, add breadcrumbs, and add a header. I can do all of this without writing a single piece of code, simply using the options within the theme. So Prose has the edge as far a “customizing” goes. I guess it really comes down to what you are trying to do. If you want to take a look at my personal site, check out craigerson.com, it’s running Prose. Hope you found this helpful. Thanks for the comment Jack and for the reminder to do this, kind of lost site of that one. I wasn’t aware of this. I’ll have to take a look and update this post. Thanks for the info. I still have the Prose theme in my site https://www.gerbengvandijk.nl. Can I just switch to another Genesis Child theme, if I will save my widget html, colorcodes etc and used code for my hooks etc? Yep – You’ll want to verify your site is still working, but shouldn’t have any issues switching to another child theme.